The AIG was treated to a wonderful afternoon at the Sivananda Yoga Centre located in Gurgaon, one of Delhi’s four major satellite cities. Led by Yogacharya Arun Pandala, who instructs over 1000 classes a year, the team learned basic positions, breathing techniques, and participated in Shavasana, a form of concentrated meditation where one is conscious yet not awake. Our only regret was we had not done this sooner, as each team member relished the opportunity for peaceful inner reflection. 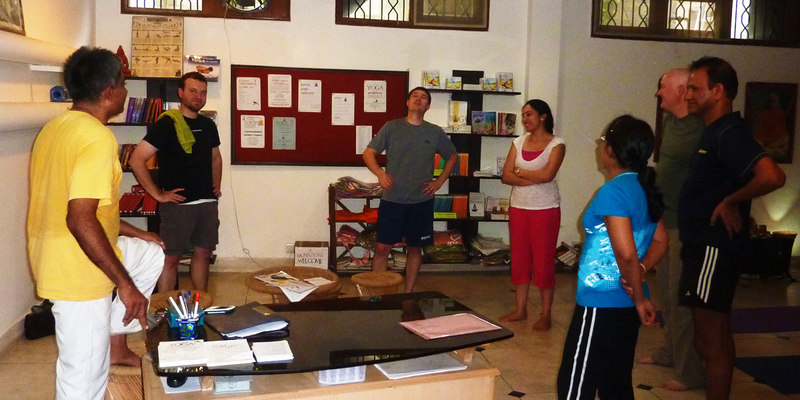 Much thanks to Arun of the Sivananda Yoga Centre and to our wonderful hosts (and friends!) for organizing the entire event, supporting us with our home visits, and putting up with all of our last minute requests and changes to the agenda. Your hospitality was truly appreciated. Looking forward to next time! This entry was posted in People, Travel and tagged Culture, Gurgaon, India.